One of the coolest aspects of the modern era of Soccer (or futbol, if you’re outside the States) is seeing the progression of the equipment and technology used in the game we love. Cleats, fields, turf, match balls and more are constantly evolving and progressing to keep pace with the game we love. Below you can see the evolution of the FIFA World Cup official match balls from all past World Cups. The 2014 FIFA World Cup has officially started and we at The Higher Learning could not be more excited! The FIFA World Cup is the largest sporting event in the world. Individual matches in past World Cups have attracted 700+ million television viewers from around the world (nearly 10% of the planet’s entire population). The World Cup has come a long way and is now one of the most valuable venues for players to showcase their skills and businesses to make money, but this was not always the case. The FIFA World Cup took decades to get full international participation. In fact, in the very first World Cup, which took place in Uruguay in 1930, only four European sides participated. Despite little initial success, the tournament overcame adversity. Today, the FIFA World Cup brings fans and players together from all over the world. This year’s host country is (suitably) Brazil. Brazil is the only country that has participated in every FIFA World Cup and is leading the pack with five championships. At the end of last month, Twitter released their earnings report numbers for the first quarter of 2014. Most notable among these was the announcement that the social media giant had officially surpassed 250 million users worldwide. Pictures are always better than numbers though, so to give analysts a better idea of global tweet activity, Twitter created an awesome visualization: it shows all the mentions of sunrise (in every language) on a map which shows sunrise and sunset across the globe. Click the image below to view the interactive animation. Despite these seemingly positive announcements by Twitter, their stock price fell 20% overnight following their earnings report. The main reason is growth, which has been slowing as of late. Twitter predicted that they would average 260 million active monthly users for the first quarter, and fell short at only 255 million, causing investors to fear that the site has already peaked and is on the downturn, or is simply a niche product which is approaching its maximum level of users. Read more about the recent earning report and what it means for Twitter from Mashable here. 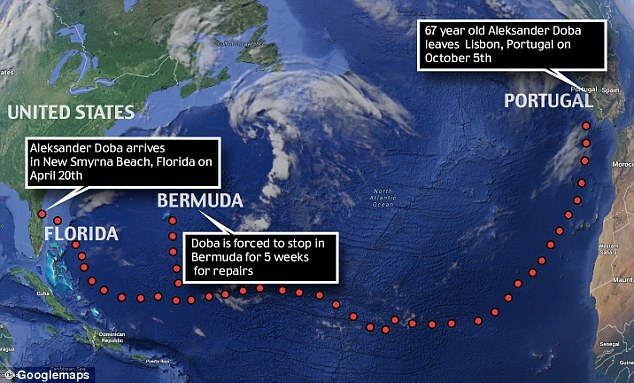 On October 5th of last year, a 67-year-old Polish man named Aleksander Doba set out from Lisbon, Portugal in a 21-foot kayak, in hopes of crossing the Atlantic Ocean and reaching Florida. Aleksander Doba’s 6,000 mile journey ended in a glorious success earlier this month when he landed at New Smyrna Beach, Florida on April 17th. Doba arrived looking like Tom Hanks from Cast Away with weathered skin and long sun bleached beard and hair. Doba’s journey is believed to be the longest open-water kayak crossing in history. Previously, Aleksander Doba had paddled 3,345 miles from Senegal, Africa, to Brazil. This journey, which he completed in 2011, spanned 99 days. Accomplishing this task took great preparation. 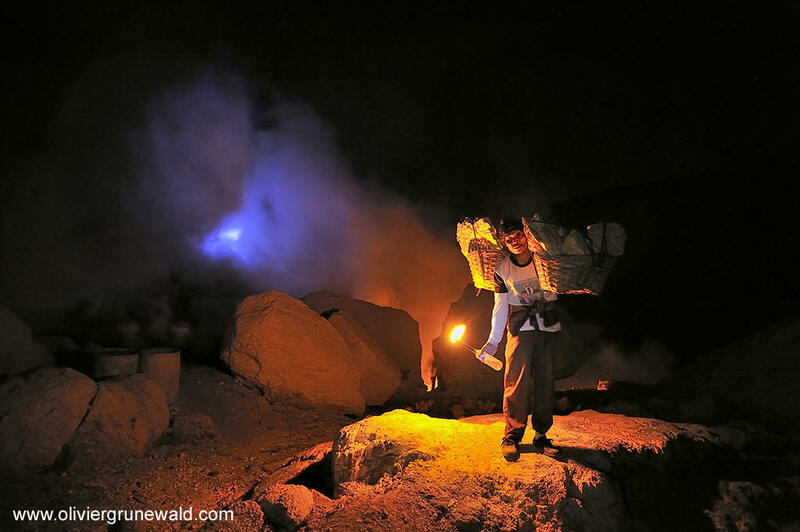 Doba had to carefully plan his meals and inventories as well as navigate winds, streams, and weather. One minor mistake could have taken Aleksander way off course or left him in the middle of the ocean without food. Aleksander Doba kissed the ground when he arrived, truly grateful of his achievement. Check out pictures below of Doba and his kayak, and check out more on the story here. Check out the photo that has created such a buzz below. 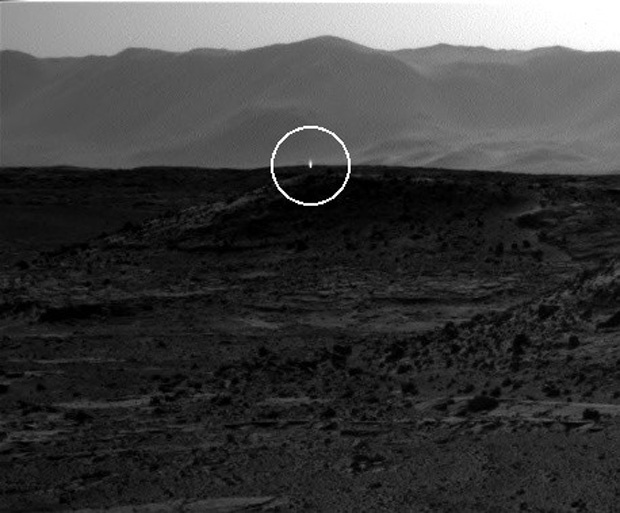 A bright flash of light appears to be visible in this image taken by the right-side navigation camera on NASA’s Mars rover Curiosity on April 3, 2014. Although many UFO advocates are loving this photo and referring to it as evidence of extraterrestrial life, the rover’s handlers have made no such claims. 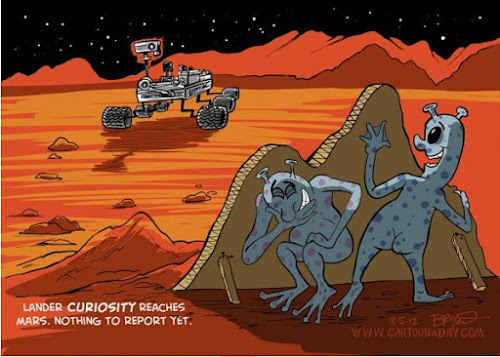 “super-energetic cosmic rays slamming into the CCD device on Curiosity’s right-side navigation camera”. Regardless of exactly what caused the light, the professionals don’t think it is anything too unusual so I’ll take their word for it. Who said that aggression or violence is extinct in humans? These two little boys don’t seem to have a malicious bone in their bodies. Check Out this adorable video of an epic Tae Kwon Do battle!